After I completed chemotherapy and had a double mastectomy, I was advised I had to have radiation. Radiation therapy is a targeted treatment of cancer cells that may stick around after surgery, using X-rays. My hair was trickling in and I was seriously fighting with regaining my self-image. The news of my scheduled radiation made me numb. Was I ever going to catch a break? 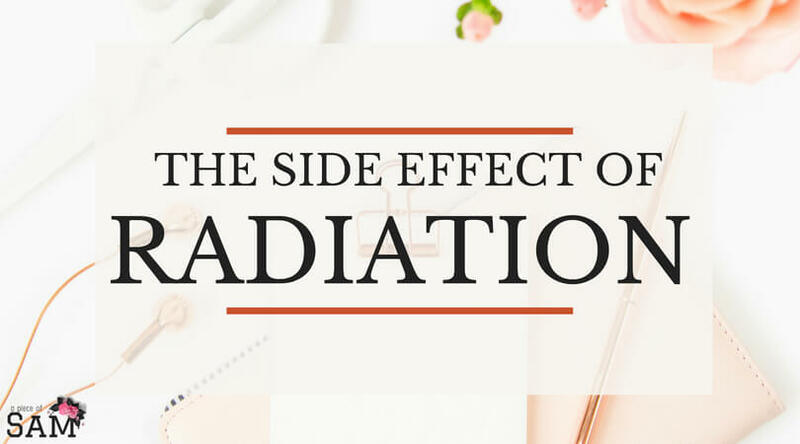 I was struck with fear when I heard about radiation. I honestly thought I was going to turn into a blood-sucking monster as I had previously seen the movie ’Chernobyl dairies’, where people turned into monsters after being exposed to chemicals. Thankfully I didn’t!!! It is amazing how the mind works and the power we all possess to control our fears. My left breast had the cancer cells but I decided to take out both breasts to reduce the chances of reoccurring and I was indeed fed up with the thing called breast. My oncologist alleviated my fears of radiation. Radiation is very targeted so it was done on my left breast, Monday to Friday for twenty-eight days. The fact I had to be at the hospital every day sent me into depression. At the end of twenty eight days, I had to do a ”boost” for five more days…..will it ever end?? But I guess it was for my own good right? The hardest part was the voices in my head as I laid down for the treatment. I couldn’t help but think about my life. I wondered whatever happened to my dreams and pursuit in life. I would think about what I would rather be doing to better my life other than being in the hospital every day. I had thoughts, so many discouraging thoughts, but I’m grateful I survived. Radiation Therapy doesn’t physically hurt during the process. It is in fact painless. But as much as the high beams destroy the cancer cells, it also affects the good cells in the area. In the third week of treatment, the skin on my left breast was burnt out and started peeling off. It also made the skin on that part seven times darker than my normal skin. I was very uncomfortable and fatigued. Just simply dressing up was a task, as the slightest touch of any fabric on my charred skin would hurt. It was during my radiation I suffered domestic violence( like I wasn’t going through enough physical trauma). I had to deal with cancer, domestic abuse, a broken marriage, being penniless and homelessness in America. I am forever grateful to the social workers, radiation oncologist and the very kind oncologist and nurses. One of them was blonde and very soft spoken. Always dressed in pastel colors and just has a very peaceful disposition around her. I often wondered if she ever gets mad at anything. She follows through on all her promises and she’s the kind of person you wish was your sister. The brunette is sassy and lovable. She’s the kind of girl you will want as your best friend. We talked about everything, including dating sites😂. She’s my go-to for solutions on daily living. I am an advocate for surrounding yourself with positive people when facing challenges in life. The burden on me was tremendously reduced with the help and support I got from my medical team. Scary and painful but God Almighty never left you even in the deepest sea. Indeed you are favoured . My mom starts radiation today for 30 days. I was already beginning to feel overwhelmed by everything happening. This just encouraged me to stay strong for her. Love, support and optimism from loved ones plays a major role in the fight against cancer, I am happy she’s got you. Keep being strong for her and tell her I love her. She’s in my prayers. Really scary, yet very inspiring. Keep being strong for you.